Measuring academic achievements is never an easy task. This is, particularly so when individuals are assessed for promotions in several fields with differing job descriptions. Assessment by peers is time-consuming and may be prone to bias; thus, objective criteria are required to minimize these concerns. The Medical Council of India (MCI) has laid down guidelines for appointments and promotions of teachers in medical institutions in India. Among the criteria used for promotions, publication of research is an essential requirement. Although the need for this requirement has been debated, it is believed that the quality of teaching improves when medical teachers are involved in research. Many countries have made it mandatory for their medical faculty to do research; some other countries incentivize the conduct and publication of research. Reports have also lamented that the physician-scientist might become an endangered species. , Thus, linking publications with promotions might benefit both the individual and society. The flipside is that the time spent on research might take teachers away from teaching or clinical duties, particularly in under-staffed specialty departments. Further, the quality of research is likely to be poor when the resources and training in research are lacking. Poor quality may even discredit research as a professional activity. Insistence on a certain amount of published research to maintain teaching credentials may lead to the phenomenon of "publish or perish." Finally, it is important to consider that biomedical research may, at times, be relevant to non-biomedical journals and criteria for awarding credit to such publications should also be devised. The MCI requires that the medical faculty engages in research. One measure to achieve this goal is the mandatory "thesis" for postgraduate (Masters; MD/MS/DNB) and postdoctoral (DM/MCh/DNB) courses. Each student, regardless of specialty, is required to undertake a research study with a faculty member as the guide and often one-to-a-few faculty members from the same or related subjects as co-guides. Apart from providing training in doing research, the thesis is expected to inculcate an appreciation for research methodology and critical analysis. This experience is relevant to students who will become full-time researchers, and is also beneficial to medical practitioners who may never conduct further research but should be able to discern the merits of newer management options for their patients. The MCI's initial guidelines for promotion to the position of Associate Professor and Professor required publication of at least two research papers by the candidates. 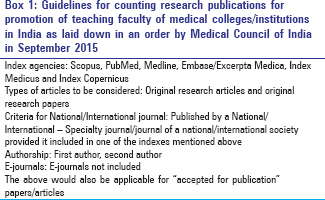 In September 2015, the MCI issued a "clarification" on what constitutes "research publications" for the promotion of teaching faculty of medical colleges/institutions in India [Box 1]. This "clarification" raises the following issues. While the MCI's corrective measure is laudable, the definition of "e-journals" is variable. We assume that the MCI implies e-journals are those that do not have a print version. This guideline would exclude many high-quality journals that are published only in the electronic format, for example, the PLoS group of journals, the Biomed Central Journals, "British Journal of Clinical Pharmacology," and "New Zealand Medical Journal." It might also exclude journals that publish papers in a longer e-version and a shorter print version (BMJ). Many believe that "paper journals" of niche specialties (with limited circulation) may soon cease to appear. Publishing is rapidly shifting to the electronic format and an explosive growth in e-journals is envisaged. Thus, the embargo on all e-journals seems unfair. The main objective of this guideline appears to be to limit predatory publishing and to ensure quality. This can be achieved by insisting on other criteria such as indexing because reputed indexes are unlikely to include predatory journals. Indexation or inclusion in select databases is an imperfect surrogate for quality. A more direct measure would probably be an assessment of each individual journal by peers. Till such an evaluation is available, we agree with the MCI's requirement that the journal of publication be listed in a recognized database. However, we suggest that the list of databases provided in the MCI's order needs a re-look. For example, Index Copernicus was last updated in 2014. Some journals listed on this index and their publishers appear on Beall's list of potentially predatory journals. In fact, Beall's blog says "index Copernicus has no value." Although the MCI's order lists Medline and Index Medicus separately, these are actually one database. Similarly, PubMed is not a database but a search engine that searches various databases including Medline and PubMed Central. More important is the omission of Science Citation Index, an important database currently published by Thomson Reuters and of IndMed, a database of Indian medical journals, curated by the Indian Council of Medical Research. We suggest the following list of acceptable databases: Medline, PubMed Central, Science Citation Index, Embase/Excerpta Medica, Scopus, and IndMed. The MCI guideline states that only "Original Research Articles" and "Original Research Papers' will be eligible for consideration. The objective here appears to be to include papers with original data and to exclude case reports and reviews or opinions. However, this guideline is not precise because different journals classify original research variously under these two and some other sections such as brief communications and short reports. Further, this clause discredits meta-analyses and systematic reviews that involve scientific interpretation of original data. Instead of prescribing specific article-type labels, the MCI could suggest that the paper should report "original research data or its interpretation in a meta-analysis or systematic review." The guidelines' implication that case reports, reviews, and opinion pieces should not carry any value remains debatable since these are an important part of the scientific dialog. The distinction between "national" and "international" journals is unclear. The inclusion of words such as "India" or "Indian" in the title does not necessarily make a journal of lesser quality. Similarly, the presence of words such as "international," "global" or "world" in a journal's name does not confer it with a higher quality. National journals are in fact more likely to publish research that is relevant to the local population. Again, this discrimination by the MCI appears to be a surrogate marker for quality. Since indexing has already been included as a criterion, the terms "national" and "international" have little value. We also suggest that the criterion of society journals be removed as indexation covers the quality requirements. The quality of a number of non-society journals (e.g., The Lancet) is widely recognized. Finally, the MCI guideline of limiting credit to only the first two authors of the paper is too restrictive. This guideline seems to be an attempt to weed out the malpractice of gift authorship. Again, the MCI's aim is laudable, but the implementation can result in greater harm. The first name in a paper is generally associated with the person who did the maximum work and the last name being that of the supervising senior. The MCI guideline suggests that other names except the first two on the byline are those of "guests." The research scenario has moved towards collaborative and multidisciplinary projects conducted by large teams. To publish a paper in a high-quality journal, a researcher needs to look at a research problem from diverse aspects (e.g., clinical, laboratory, genetics, and immunology). Hence, good papers often have multiple authors with an equal contribution, and all of them deserve equal credit. The MCI guideline may not only deny credit to all those who have contributed, it may even encourage the practice of denying the first authorship, and credit, to junior researchers whose contribution is often maximum. The experience of many medical editors shows that it is not uncommon to find the senior-most author as the first author (even in case reports) due to the premium placed on this position. Therefore, we suggest that this guideline should be removed, and all the authors of a paper should receive credit for it. We appreciate the MCI's intention to give research its due recognition in academic institutions as well as for streamlining the process of promotion of teachers. Our suggestions to amend the existing guidelines, summarized in Box 2, can help remove ambiguities in the new MCI guidelines. These could also serve as the starting point of a wider consultation on the evaluation of research performance of medical teachers in India. Rosenberg L. Physician-scientists - Endangered and essential. Science 1999;283:331-2. Wyngaarden JB. The clinical investigator as an endangered species. N Engl J Med 1979;301:1254-9. Gitanjali B. Identifying a research topic: The problem is the problem. Indian J Pharmacol 2005;37:67-8. Colpaert J. The ′publish and perish′ syndrome. Comput Assist Lang Learn 2012;25:383-91. Medical Council of India. Minimum Qualifications for Teachers in Medical Institutions Regulations, 1998 (Amended upto May 2015). Available from: http://www.mciindia.org/Rules-and-Regulation/TEQ-REGULATIONS-16.05.15.pdf. [Last accessed on 2015 Dec 21]. Available from: http://www.mciindia.org/circulars/Circular-03.09.2015-TEQ-Promotion-Publication.pdf. [Last accessed on 2015 Dec 08]. Shen C, Bjork BC. ′Predatory′ open access: A longitudinal study of article volumes and market characteristics. BMC Med 2015;13:230. Llewellyn RD, Pellack LJ, Shonrock DD. The use of electronic-only journals in scientific research. Issues Sci Technol Librariansh 2002;35.doi: 10.5062/F41V5BZM. Available from: http://www.en.indexcopernicus.com/. [Last accessed on 2015 Dec 01]. Available from: http://www.scholarlyoa.com/publishers/. [Last accessed on 2015 Dec 20]. Available from: http://www.scholarlyoa.com/2013/11/21/index-copernicus-has-no-value. [Last accessed on 2015 Dec 20]. Bandewar SV, Pai SA. Regressive trend: MCI′s approach to assessment of medical teachers′ performance. Indian J Med Ethics 2015;12:192-5. Zbar A, Frank E. Significance of authorship position: An open-ended international assessment. Am J Med Sci 2011;341:106-9. Goel A, Kumar S, Mandhani A, Panda A, Kumar R. Authorship Misconduct in a Small Specialty Journal: A Retrospective Review. Poster Presentation at the First WAME International Conference for Medical Journal Editors, 2-4 October, 2015; New Delhi, India; 2015.